Put a desktop PC in a laptop and what do you get? A giant laptop that you never want to take anywhere because it gives you chronic back pain. Not anymore. MSI’s Min Phantom Pro contains an i7 processor and a GeForce GTX 1060 graphics card, a 256GB SSD, and a 1TB hard drive, so it’s no surprise that it’s nearly an inch thick. But at 1.8kg it’s lighter than a 15in MacBook Pro. Not that you’d mistake it for an Apple product. The GS43VR’s black plastic case is from the sci-fi mothership school of design, with lots of angled planes, chunky vents and glowing red lights. There’s aluminium here as well as plastic, but the area in front of the keyboard flexes when you rest your wrists on it. The keyboard, featuring SteelSeries customisable backlighting, felt a bit on the wobbly side, but it’s quite acceptable, and so is the trackpad. more accurate color as well as generally better build quality, but it also weighs nearly two pounds more with a smaller screen. Inside is an Intel i7-7700HQ, no longer the latest in laptop processors but, being one of the few Kaby Lake laptop chips with four cores, it’s certainly no slouch. Helped along by 16GB of memory and a very fast M.2 SSD, which read more than 2,200MB per second in our tests and wrote nearly 1,250MB, it’s ready for almost any Windows 10 task. Playing games – paired with the excellent GTX 1060, which has the full 6GB of onboard memory – it narrowly beat the pricier Alienware 13, running every game we tried in Full HD with smooth frame rates. It struggled to stay cool while doing this, but never got too hot or noisy. Virtual reality shouldn’t be a problem if you have a headset or are tempted by the recently discounted Oculus Rift. So is it really possible to carry around a full-blown PC without breaking the bank – or your arms? Well, yes and no. You can take the Phantom Pro anywhere you like, but unless there’s a mains plug your 3D gaming session isn’t going to last much more than an hour. MSI reckons up to four hours is possible when you’re not doing anything demanding, but it still leaves this laptop looking like a machine you can drag between rooms around the home or at work rather than one you’ll want to use when out and about on trains, for example. If performance is the priority, though, it’s not a bad deal at all. You could find a similarly equipped desktop PC for or so, which works out cheaper even after adding a monitor, but we’d expect to pay more for portability. If you check Amazon and eBay, you may find it for under Dell’s Alienware 13, with the same processor and graphics card, a slower SSD and no hard drive, costs It’s undeniably better made and has a superior screen, but its higher resolution just makes the graphics card work harder. 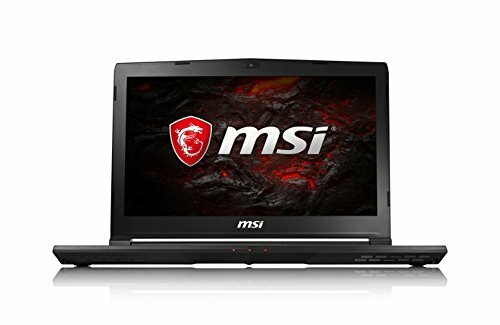 MSI has compromised in the right places and delivered a better bargain.